I am of the age that I can clearly remember watching the first landing on the moon and the first time mankind walked on the moon. And I remember the Apollo-Soyuz Project and seeing the artist’s conception of the two spacecraft docking, miles above the Earth (and what a strange-looking bug that Soyuz craft was to me). And because of this, I’ve grown up with a fascination and interest in the U.S. space program (which may explain why two of my children are pursuing dreams of working professionally in the space program). 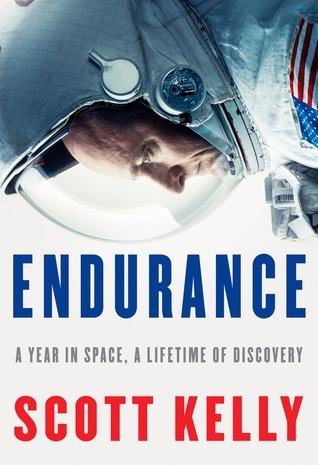 Memoirs such as astronaut Scott Kelly’s Endurance hold a special fascination for me. For those who don’t already know, Scott Kelly has been to space a few times – as part of the space shuttle program and to the International Space Station (ISS). Most recently he was one of two astronauts (the other, Russian cosmonaut Mikhail Korniyenko) who spent nearly one entire year aboard the ISS – the longest anyone has been outside the constant pull of Earth’s gravity to date. There are many reasons to subject a human to this, just one of those being that we want to study the effects of long-term weightlessness on the human being because if we ever want to put someone on Mars, or even further away than that, we’re clearly looking at some long-term weightlessness for those adventurers. That Scott Kelly has a twin brother, who is also an astronaut employed by NASA, helps with the study as a control subject. What is particularly fascinating about this book is the first-hand account of the day-to-day work about the ISS. The reader gets the impression that Scott Kelly doesn’t hold back on much and simply tells it the way he sees it – which isn’t always flattering to NASA. But he also describes what might otherwise be considered a mundane work day (fixing toilets, dissecting mice, taking out the trash) except for the fact that it’s done in space. The challenges he faces for some of the most routine tasks are often very interesting to read about. And of course there are the fun facts that we really could only get from an astronaut, such as the smell of the exterior metal of the ISS when the capsule first docks. And the smell of the interior of the ISS. And the appearance of the dinged and pitted exterior walls from the plethora of micrometeors that strike the station. The book is more than just a diary of Kelly’s year in space. It is a memoir and we have alternating chapters so that we get a sense of who Scott Kelly is and how he came to be the astronaut who spent a year in space. From his early school days, his parents’ relationship and goals, his attempts to get in to college once he knew what he wanted to do, and his drive to become an astronaut. Knowing these things about him helps us to understand why he would leave family on Earth for so long to put himself through what he did. What we don’t get is the effects. Kelly teases us at the start of the book with his just having returned to Earth and eating dinner with his extended family and suddenly having some health issues – to the degree that his partner wants to get him to a doctor immediately (to which he points out that very few doctors in the world would understand the symptoms and conditions of a man who’d just spent nearly a year in weightlessness). But we never come back to this. We don’t get the expected summary of what likely caused this health crises. We understand it’s related to his living in space, but does it get better? What specifically caused it? How much of this has to do with the amount of time spent in space? As much as I liked this book all the way through, I really miss the lack of follow through on this attention-getting opening. Still, as we hope for expeditions further into our solar system, and beyond, this is an important step and it’s good for all of us to understand the sacrifices. Looking for a good book? Scott Kelly’s Endurance, shares the spirit of adventure and exploration that Shackleton’s Endurance had, but with a nod toward the future.